Stiff as a board! With White Cardboard Mailers, you can ensure security and rest easy that your mail is going to get where it needs to be safely. When security is key cardboard is crucial. With these durable mailers your content will remain intact and unscathed. 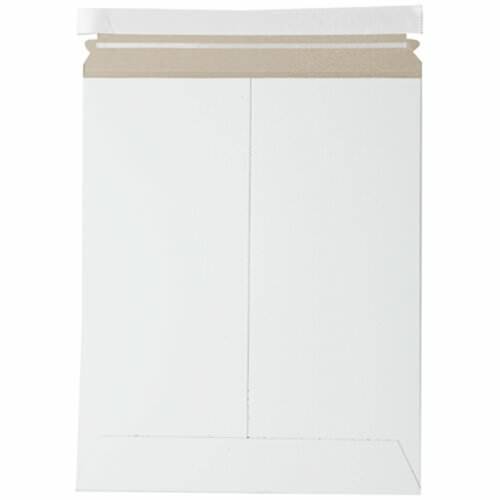 Use our White 11 x 13 1/2 Envelopes for photographs, important documents and fragile files. A neutral white exterior is common for formal mailings and business related content, but if you’re looking to get creative you can just as easily decorate these as well. White Cardboard Mailers measure in at 11 x 13 1/2 inches and are available with peel and seal closure. White Cardboard 11 x 13.5 Envelopes can be ordered individually or in bulk. Love the white but searching for another size? Love the Cardboard Mailer but want it in a color? Check under 'Other JAM'n Products You Might Like' to find our wide selection of both white and color photo mailers!